The C-17 meets an RAF requirement for an interim strategic airlift capability pending the introduction of Future Transport Aircraft (A400). The decision to lease four C-17 aircraft for some £771m from Boeing was taken in 2001, and the aircraft entered service in 2001. The lease was for a period of seven years, with the option to buy or extend at the end of that period. The option to buy the leased aircraft was exercised in August 2006 together with signature of the contract to procure a fifth new C-17 aircraft which was delivered in April 2008. A sixth C-17 was ordered as a result of a £130 million contract signed in December 2007 and was delivered in July 2008. Two more were ordered in 2010 and 2012. The C-17 fleet is capable of the deployment of 1,400 tonnes of freight over 3,200 miles in a seven day period. The aircraft is able to carry one Challenger 2 MBT, or a range of smaller armoured vehicles, or up to three WAH-64 Apache aircraft at one time. Over 150 troops can be carried. In-flight refuelling increases the aircraft range. 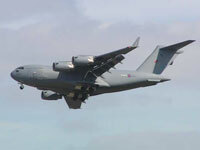 By 2013 the unit cost of the C-17 was believed to have risen to around £200 million. No 99 Sqn has some 180 flight crew and ground staff.